Be the first to share your favorite memory, photo or story of Rheta. This memorial page is dedicated for family, friends and future generations to celebrate the life of their loved one. Rheta M. Jonkers, 96, of Chicago, passed away Thursday March 7, 2019, at her home in her beloved city of Chicago. Cremation rites have been accorded. Graveside services will be held at a later date. Memorials may be made to the charity of the donors’ choice. Calvert & Johnson Memorial Home, Henry, is assisting the family with arrangements. Rheta was born September 14, 1922 in Toluca, IL to Frank and Christine (Pelz) Hall, Sr. She married the love of her life, Joe Jonkers on the Hall family farm in Toluca. He preceded her in death on July 20, 1993. Surviving are her nieces and nephews, Delores Parks, of FL., Barbara Rodgers, Janet Thiele, Sandra Kenyon, Cathy Marshall and Bill Kenyon, all of Illinois and many great nieces and nephews. Her parents and siblings, Frank Hall Jr., Lorraine(Hall) Odekirk, Mildred (Hall) Kenyon, and Marion (Hall) Marshall preceded her in death. 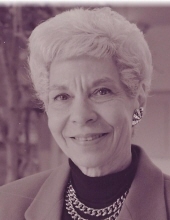 Rheta worked as an executive secretary for Rheem Manufacturing in Chicago for many years. After her retirement she worked at Marshall Fields, Chicago. She was a very well known and loved person, especially in her area of Chicago. Rheta will be remembered for her style and her love of the color pink. She will be missed by all who knew her. "Email Address" would like to share the life celebration of Rheta M. Jonkers. Click on the "link" to go to share a favorite memory or leave a condolence message for the family.